DEBRIS — Old, battered cars litter the scene of a large fire at Tolpa's Auto Parts on French Road in Steuben Wednesday afternoon. Forestport firefighters were some of several volunteer agencies dispatched to the scene. THREE GARAGES LOST — Heavy smoke billows into the air as a Stittville ladder truck blasts water down into a large fire at Tolpa's Auto Parts off French Road in Steuben. Fire officials said three workshops were lost in the blaze. WATER EVERYWHERE — Firefighters fill up a portable pond at the scene of a large fire at Tolpa's Auto Parts on French Road in Steuben this afternoon. Water had to be tankered to the scene from multiple fill sites, while crews also slogged through freezing rain. MULTIPLE CREWS — Barneveld was one of more than half a dozen volunteer fire departments helping out at the fire at Tolpa's Auto Parts off French Road in Steuben Wednesday afternoon. TOWN OF STEUBEN — Three workshops were destroyed — and no one was injured — during a large fire at Tolpa's Auto Parts on French Road this afternoon. Remsen Fire Chief Scott Kahl said employees were cutting up a motor vehicle inside one of the garages when an errant spark ignited a flammable material inside the auto garage. "It was 100-percent accidental," Kahl said from the fire scene. Tolpa's Auto Parts is located off French Road, southwest of Alder Creek. The shop is located back off the roadway up a hill, with the pathway quickly covered in solid ice from the water run-off and the freezing rain. A dirt truck had to be called to the scene to make the ground passable for firefighters. Kahl said the alarm was raised at about 1:41 p.m., with multiple calls to 9-1-1. 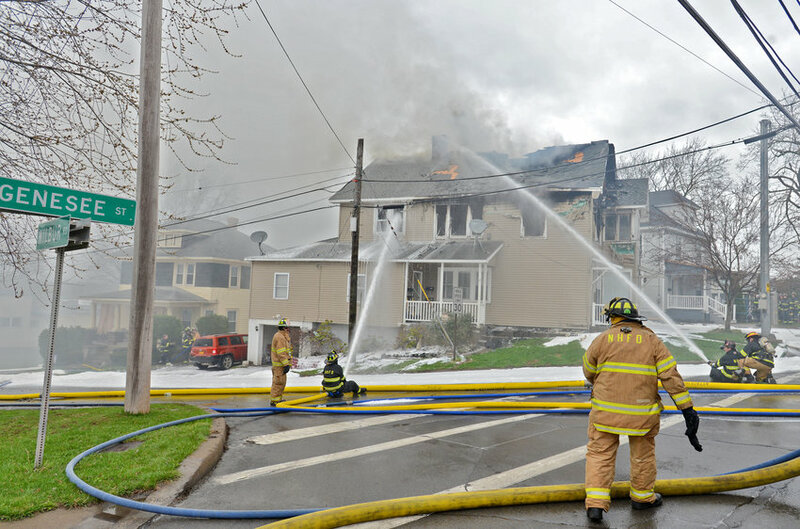 At least seven volunteer fire departments responded, tankering water to the scene from multiple fill sites as they struggled in the chill and the rain. Kahl said the fire spread across three large garages behind the business. He said the firefight would take several hours. The chief said no people were injured in the fire, though one firefighter needed to be evaluated at the scene. Remsen, Barneveld, Boonville, Forestport, Stittville, Floyd, Otter Lake, Woodgate responded to the scene, with more departments on standby.